The starter solenoid may be located away from or on the starting motor. When mounted away from the starter, the solenoid only makes and breaks electrical connection. When mounted on the starter, it also slides the pinion gear into the flywheel. In operation, the solenoid is actuated when the ignition switch is turned or when the starter button is depressed. The action causes current to flow through the solenoid (causing a magnetic attraction of the plunger) to ground. The movement of the plunger causes the shift lever to engage the pinion with the ring gear. After the pinion is engaged, further travel of the plunger causes the contacts inside the solenoid to close and directly connects the battery to the starter. If cranking continues after the control circuit is broken, it is most likely to be caused by either shorted solenoid windings or by binding of the plunger in the solenoid. Low voltage from the battery is often the cause of the starter making a clicking sound. When this occurs, check all starting circuit connections for cleanliness and tightness. FIELD FRAME. - The field frame is the center housing that holds the field coils and pole shoes. TWO WINDINGS, PARALLEL - The wiring of the two field coils in parallel will increase their strength because they receive full voltage. Note that two additional pole shoes are used. Though they have no windings, their presence will further strengthen the magnetic field. 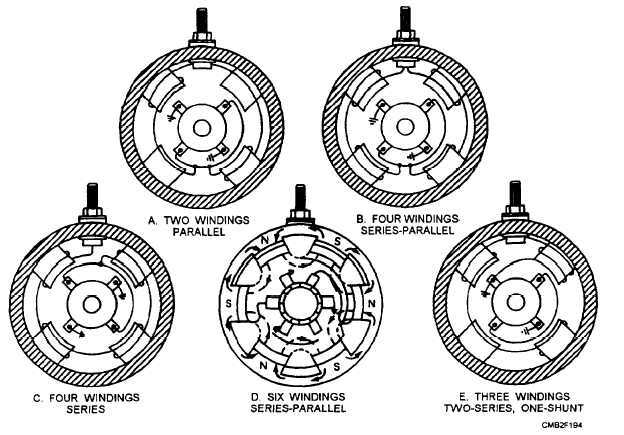 FOUR WINDINGS, SERIES-PARALLEL - The wiring of four field coils in a series-parallel combination creates a stronger magnetic field than the two field coil configuration. Figure 2-41. - Field winding configurations.